Heard the story about the fun gal and the fun guy? Have you heard the story about the 'fun-gal' and her boyfriend, Gus? 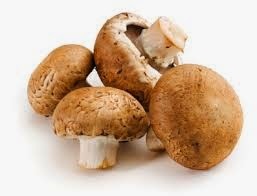 They thought a great way to spend an evening was dining out on mushroom-stuffed cuisine. "It's a lot of fun, Gus said;-). I'll return to reason and spirituality next time. Who Owns the Land in Israel/Palestine? "But when we shift the question from "which people has a right to this land?" to "how do we extend full human and civil rights to all who live on the land?" we discover a decidedly different Biblical vision. We lift up the God who tells us that all humanity is made in the divine image--and that when push comes to shove, the land does not ultimately belong to any of us, but to God and we are strangers upon it." On his farm outside Bethlehem, Daher Nassar is picking apples from the ruins of the orchard he planted at least eight years ago. The fruit is scattered across ground freshly opened and imprinted with the tracks of a bulldozer. At the field's edge, branches reach out from inside a mound of earth, the bark stripped and mangled, unripe almonds still clinging to the trees. 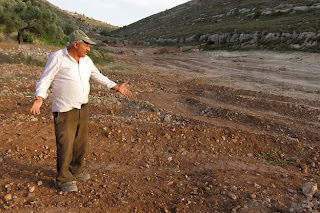 On 19 May a Palestinian shepherd from the village of Nahalin was out at first light and saw the bulldozer at work in the field, guarded by Israeli soldiers. By the time Nassar arrived the whole orchard - the best part of a decade's work - was gone. His English is far from fluent, but there's no mistaking the pain in his voice: "Why you broke the trees?" Nassar's sister, Amal, has a different explanation. The government, together with the Israeli settlers who live around the farm, is "trying to push us to violence or push us to leave," she says. Amal insists that her family will not move from the land, nor will they abandon their commitment to peaceful resistance. "Nobody can force us to hate," she says. "We refuse to be enemies." Bishara ("Gospel") Nassar was a child when his father bought this land in 1916. Even at that time, as World War One transformed the Middle East and the Ottoman Empire limped to an end, Palestinian Christians were beginning to emigrate. After the war of 1948 the Christian exodus from the West Bank quickened, and Bishara, who was a gifted preacher and accordionist, began to travel round the nearby villages, singing songs and leading Bible study in family homes. Music and stories, he thought, might deepen the faith and lift the spirits of Bethlehem's Christian children, encouraging them to stay. "My father always said, 'We will never achieve peace in Palestine and Israel just by shaking hands - we need to work on people, to start with the grassroots'," says Amal Nassar. "So what we do now, as a family, is fulfilling the dream of my father that people can build bridges, for hope, for understanding, reconciliation, dialogue, to achieve peace. This is the idea." For more than 20 years they have held workshops here, welcoming Israeli students, rabbis, and peace activists, as well as groups from across Europe and America. They run summer camps for local schools, teaching Palestinian children about non-violence and encouraging them to develop a love for the land by working and playing on the farm. This is especially important, says Amal Nassar, for a generation that has grown up in the refugee camps and urban sprawl behind Israel's separation barrier. She also trains Palestinian women in non-violence, while her mother - Bishara's widow, Milada - cooks traditional food for the day's guests. Milada Nassar says her husband would have been proud of what his children have created. But in the years since his death in 1976, the family's commitment to non-violence has been tested in ways he could never have imagined. At that time the West Bank had been under Israeli military rule for almost a decade, and Jewish settlers were just beginning to move into the area south of the farm. For the most part, though, the hills around Bishara's land were still open countryside, farmed by Palestinian families or used as grazing by shepherds. In the 40 years since, Israeli settlements have been built on every one . There are five settlements in total, the nearest so close that the settlers' voices carry across the valley to the farm. The most recent, Netiv Ha'avot, is little more than a strip of houses encircled by coils of razor wire and festooned with Israeli flags. The largest, Beitar Illit, is a town of more than 40,000 people, a blaze of lights on the hillside at night. All of them are considered illegal under international law, though Israel disputes this. In 1924, realising that the Ottoman Empire was finished and worried by rising tensions between Arabs and Jews, Bishara Nassar's father had registered his property with Palestine's new imperial rulers. The British issued land deeds that specified the size and borders of the farm, and Bishara's father, who was a literate man, held on to the documents. Almost 70 years later, those papers would form the basis of a legal case that has been in front of the Israeli courts for 23 years. It remains unresolved. "They know very well that the Palestinians cannot afford to defend the land," says Amal Nassar, "so they give up hope and leave." But the family have somehow found the money and determination to keep their appeal alive. "Every time they see you are ready to meet their demands, they ask [for something] more and more difficult, [so] that you say 'I am fed up, I cannot.' Yes, this [is] always the process. We know it. It's a game to push us to leave." The way Amal sees it, the Israeli military and the settlers, having failed to evict the family by legal means, are now trying to force them out. She remembers the settlers who uprooted 250 young olive trees in 2002, and who permanently closed the road to the farm with rubble. The demolition orders posted on the gate, threatening to destroy the Nassars' home and water wells. The soldiers who, in 2009, forced her 72-year-old mother out of bed at gunpoint in the middle of the night and made her wait in the cold while they searched the farm. The Israeli authorities in the West Bank insist that by destroying the Nassars' orchard and posting demolition orders on the Tent of Nations, they are simply enforcing planning regulations. "We are not intimidating the family," said a spokesperson for CoGAT, the body responsible for implementing Israeli policy in the West Bank. "We are not doing any of those steps in order to make the family leave. We are enforcing the law." The Israeli military did not respond to the specific allegations made by the Nassars, but they, too, denied that the family is subject to a campaign of harassment: "The assertion that the IDF seeks to intimidate as a means of eviction is farcical, and an absolute contradiction of the reality on the ground in Judea and Samaria [West Bank]. The reality of Judea and Samaria, in which acts of Palestinian terrorism and extreme violence continue to rise, presents a complex security challenge. Nonetheless, the IDF remains committed to fulfilling its mission of safeguarding security and stability in the region, in a highly professional manner based on the morals and code of ethics that stand as a pillar of all IDF activities." Amal Nassar's younger brother, Daoud, is not impressed by the moral code of the men who uprooted his orchard. But neither is he angry: "We are willing to build up a better future in a non-violent way… without hatred," he says. "Our response to this injustice will never be with violence, and we will never give up and leave." Palestinians have a word that captures this refusal to be provoked or demoralized: sumud. Sometimes translated as 'steadfastness', sumud describes the stubborn, patient determination to stay on the land and to carry on in spite of all the difficulties of living under military occupation. It is a quality embodied by Daher Nassar, who, even as he walks across a scarred and empty field, is imagining the orchard he'll harvest 10 years from now. "I will plant more trees," he says. "Double trees."